There are multiple ways an alien can immigrate to the United States, and the specific procedures, forms and requirements vary with each immigration type. Immigration can be done through work, family, marriage, as a refugee or as a winner of the diversity lottery. Each immigration method has its own requirements, but all follow a basic form of standard procedures. Many immigrant visas including work, family and marriage require filing a petition to get the process started. Petitions are applications filed by a second party, never the immigrant themselves. For a permanent work visa, the applicant's employer must file Form I-140 Immigrant Petition for Alien Worker on behalf of the applicant. For a family visa, a U.S. citizen family member must file the I-130 Petition for an Alien Relative, and for an immigrating fiancé(e), the U.S. citizen must file Form I-129F Petition for an Alien Fiancé(e) on behalf of his or her fiancé(e). The sponsor must file all petitions and send the petitions to a United States Citizenship and Immigration Services (USCIS) filing center before the visa application can begin. Refugees, asylees and diversity lottery winners do not require petitions. In all cases, the immigrant cannot begin the immigration procedure until the USCIS approves his petition and forwards it to the National Visa Center (NVC). After the NVC receives the petition, it contacts the U.S. Consulate General indicated on the petition to review the visa application. The consulate then contacts the applicant to schedule a visa interview. All immigrants must attend an immigration interview before obtaining a visa. The interview serves to verify the information stated on the petition, present application forms and evidence of eligibility and intent. Applicants must also submit to an electronic biometrics fingerprint scanning. All immigrants must have a biometrics scan before being allowed entry into the country. However, each visa type requires various documents and proof of eligibility. For instance, the interview for a fiancé(e) visa (K-1) requires an extensive interview during which proof of relationship must be presented. If the applicant "passes" the interview, he is then presented a visa for immediate entry into the United States. After entering the United States, all immigrants must apply for permanent residency by filing form I-485 Application to Register Permanent Residence in order to obtain a green card. All immigrants obtaining permanent residency must file this form regardless of entry visa at the risk of deportation. Those who enter the U.S. on a K-1 fiancé(e) visa cannot file Form I-485 until after marrying the U.S. citizen fiancé(e). Special procedures generally refer to those immigrating as refugees or asylees. While refugees do go through an application and interview process at a U.S. consulate, they do not have to pay any application fees or prove stability before being granted a visa. On the other hand, an asylee does not receive a visa until after arriving in the United States. Both refugees and asylees can only apply for a green card after one year of residence in the U.S. The green card fees (I-485 fees) do not apply to refugees or asylees. Another special procedure is the diversity lottery. The diversity lottery is literally a lottery that applicants from select countries enter in order to receive an immigrant visa to the U.S. Applicants do not need to have family connections or a secured job, and simply apply to enter the random drawing. Once chosen, applicants must submit application material and attend a visa interview at a U.S. Consulate General. Ferland, Mallory. "United States Immigration Procedures." 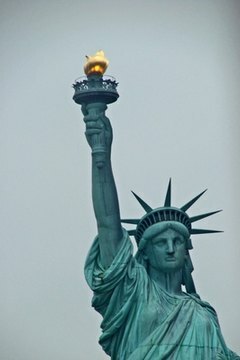 , https://legalbeagle.com/6783070-united-states-immigration-procedures.html. Accessed 20 April 2019.